Roslyn Oades is an award-winning Melbourne-based artist best known for her innovative work in the field of headphone verbatim and audio-driven performance. Her original works for theatre include: Hello, Goodbye & Happy Birthday (Malthouse/Melbourne Festival), I’m Your Man (Belvoir/Sydney Festival/Mobile states), Stories of Love & Hate (Urban Theatre Projects/STC), Fast Cars & Tractor Engines (UTP/BYDS), Cutaway–A Portrait (Vitalstatistix), At the Hip (HotHouse Theatre) and the immersive work for children, In A Deep Dark Forest (The Inhabitors/Arts Centre Melbourne). Her works have toured nationally with Performing Lines and I'm Your Man was recently adapted by SBS into an online interactive documentary. Roslyn's signature works are predominantly audio-focused and she regularly collaborates with sound artist extraordinaire Bob Scott. In 2017 Roslyn embarked on a new series of site-specific audio documentary projects. Cell 26, an audio work designed for a prison cell can currently be experienced in a restored prison cell at Ulumbarra Theatre (formerly the Bendigo Gaol) and Sea Stories, an audio work designed to accompany sunrise was commissioned by Festival 2018, the Commonwealth Games Arts & Culture Program on the Gold Coast. Most recently Roslyn collaborated with Bob Scott to co-create The Nightline an immersive late-night listening club for the sleepless as part of Urban Theatre Project’s inaugural RIGHT HERE RIGHT NOW festival of place-based contemporary arts in Western Sydney. Hello, Goodbye & Happy Birthday received a Green Room award for outstanding writing/adaptation for the Australian Stage and toured Australia with Performing Lines in 2017. Her theatre productions have also been shortlisted for the NSW Premiere’s Literary Award, 2 Helpmann Awards, 2 Sydney Theatre Awards and an AWGIE Award. 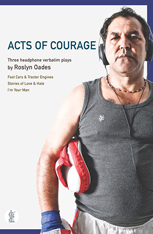 A trilogy of Roslyn's headphone verbatim plays, titles Acts of Courage, is available through Currency Press. She is also a contributing author on VERBATIM Staging Memory & Community edited by Paul Brown (Currency Press, 2010). For the Sweatshop collective she has directed two performing writing events: #Three Jerks (Sydney Writers Festival/Melbourne Emerging Writers Festival) and Alleyway Honour (Sydney Writers Festival). Roslyn is also a sought after dramaturg and mentor in the field of documentary theatre. Roslyn Oades & Collaborators was a recipient of the Sidney Myer Fund, Arts & Humanity Capacity Building Stream (2015-16). Her past residencies include: Artist-in-residence with Urban Theatre Projects for RIGHT HERE RIGHT NOW (2016-18), 2013 Director-in-residence at Malthouse Theatre and Artist-in-residence with Campbelltown Arts Centre for Siteworks 2011 (curated by Rosie Dennis). Headphone-verbatim theatre takes real life and fuses it into storytelling, with the aid of headphones. Acts of Courage presents three of headphone-verbatim pioneer Roslyn Oades' work. Fast Cars & Tractor Engines weaves a diverse range of intimate conversations to create a smorgasboard of Australian voices of cohesive unity. Stories of Love & Hate tells the complex story of the Cronulla Riots; and I'm Your Man shines a light on some of the best-known boxers in Australian. Acts of Courage forges immediacy and honesty between a vast range of Australian stories, generating forgiveness and hope in the act. Oades' unwavering loyalty to the words, sounds and silences of every day conversations conveys a steadfast loyalty to the experiences and the people from which they come. This trilogy celebrates not only the human spirit in times of hardship but everyday extraordinary acts of courage. A guide intended for both teachers and students at senior high school level. This publication emerges from a series of workshops with high school teachers in 2008 and 2009, and is written by educators and theatre makers who have practical experience of verbatim theatre and other documentary styles. Contributors include: James Arvanitakis (UWS), Paul Brown (UNSW), Paul Dwyer (USYD), Ulrike Garde (Macquarie Uni) Meg Mumford (UNSW), Roslyn Oades (Theatre maker) and Caroline Wake (UNSW). Rather then reciting memorised lines, in a headphone-verbatim show, actors wear headphones and speak along to a sequence of carefully edited audio interviews word-for-word. By confining the actors to the discipline of accompanying a recording with absolute precision (including every inflection, cough, stumble, breath and overlap), a curious, hyper-real performance style is established. While the actors often adopt characters with an accent/background/age/gender obviously not their own, the discipline of this technique prevents parody or interpretation. It also allows the many quirks and imperfections of human speech to be acknowledged with integrity. As a theatre-maker, Oades operates from the principle there is as much information embedded in the way someone speaks as what they are saying. By meticulously preserving the vocal print of real-life interviews in performance, her cast sets out to mine the rich nuances of conversational speech like musicians following a score. Roslyn's experimentations with headphone-verbatim performance began in 2001 at the London Actors Centre. She gratefully acknowledges the early mentorship of UK director Mark Wing-Davey, as well as the generous contribution of long-term Australian collaborators: Michael Mohammed Ahmad, Katia Molino, Tim Carroll, Bob Scott, Neil Simpson, Clare Britton, Alicia Talbot & Lee Wilson - all of whom have made a profound contribution to her pioneering body of work in this field.